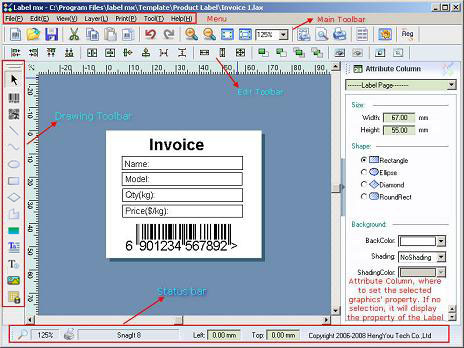 Label mx is label designing and printing system which is professional and easy to use. It is exploited by HengYou Technology Co.,ltd. Label mx is label designing and printing system which is professional and easy to use. It is exploited by HengYou Technology Co.,ltd. Setting Design Drawing, Barcode Generation, Making Labels and Printing Groups in one. The interface is friendly and easy to use which users needn't to have professional knowledge. The system takes a great deal of designed templates, so users can creat label by making a change the templates slightly according to demand. It can be used in various of profession fields.Such as: Card, Product Labels, Book Management, Package Printing, Advertisement Project, Production-manufacturing, Logistics, Chain Group and so on. Support all the printers,such as Common printer (Color Ink-jet Printer or Laser Printer), Label Printer, Digital Printer and Industrial Printer. It can create more than thirty kinds of 1D barcode( EAN-13\8,UPC-A\E,CODE-128A\B\C,CODE39...) and some 2D barcode(PDF417, MicroPDF 417, Data Matrix, MaxiCode, QR Code...). What you see is what you get!Support to draw graphics:Barcode,Text,Image,Data source, Line,Curve,Rectangle,Filled Rectangle,Diamond,Polygons. Easy to connect database such as :Text file, EXCEL file, Access, DBF, EDB, MySQL, SQLServer, Oracle, Sqlite, IBM DB2. The barcode drawn can be exported as picture and be imported to the Coreldraw, Illustrator and other drawing software to use. Print the numerical order and flow-barcode if you need(such as 001,002,003...). It has batch barcode maker with which you can make more numerical order and flow-barcode for printing groups. Support DIY setup for ruleless print. Inventory Manager - A new, easy to use inventory control program with some additional features usually only found in larger ERP/MRP systems. Maintenance Parts Bin - Is a system for keeping inventories of parts and determining when reorders are necessary. Morovia Code 39 Fontware - Allows you to print Code 39 barcode symbols (also called as Code 3 of 9, USS code 39, HIBCC and LOGMARS) from any computer systems. Chrysanth Inventory Manager - Is an excellent program which provides a powerful yet flexible inventory management system mainly for small to medium sized business environments. Retail Man - The Retail Man was designed for business people who have only limited knowledge of accounting principles. Barcode Label Maker Starter Edition - is an easy-to-use, fully featured software for designing labels, creating barcodes and printing your labels.